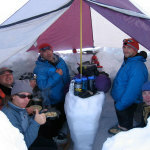 Mt Baker-BC Kitchen at it’s finest! 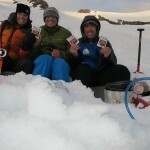 What type of trip: climbing, ski touring , backpacking or water based? The terrain you travel in affects what kind of weight and bulk you can carry with you. The more technical trip requires a balance of equipment and calories. A climbing trip may include 10 pounds of gear and require at least 3,000 calories to maintain your activity which adds up to at least 2 pounds of food per day. What season will the trip take place in? This impacts fuel consumption, caloric needs and stove selection i.e white gas versus isobutene cartridges. 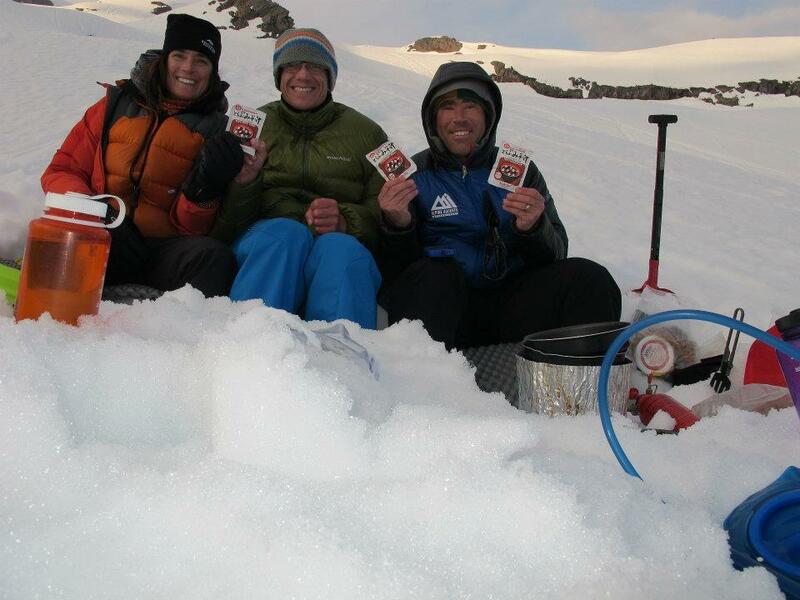 Winter/Spring and High Altitude trips require melting water thus more fuel and simpler meals. Duration: how many days, will you fly in to a base camp, or travel by foot everyday? The next 5 factors allow you to judge whether each meal will be appropriate for your trip. Weight: Because long-distance travel over many days makes food weight one of the key meal-planning parameters. Not all heavy foods need to be left at home, especially those that are calorically dense and offer a lot of nutritional bang for the ounce. Nutrition: Understand your body’s own unique requirements, pack foods to support it, and prepare for the dramatic increase in caloric intake that will likely require you to carry more food per day than you are accustomed to on shorter ventures. Mountain adventures can consume 3-5,000 calories in a day! Taste and Variety: Food is a powerful motivator, and must taste good to provide a psychological reward during a difficult day. Meals must be varied enough to avoid becoming repulsive over time. 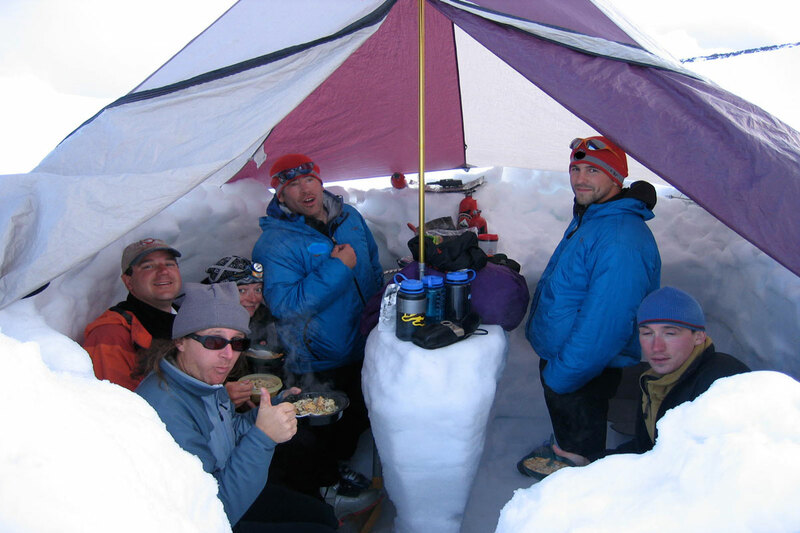 Simplicity: Freezing rain and tent-flattening winds require simple trail-side food preparation. ‘One-pot’ meals help achieve this goal, making food preparation and cleanup less challenging, especially in areas lacking nearby water sources. Durability: The interior of a backpack can tear your food apart. This extreme environment within a backpack requires that food be durable enough to survive for extended periods of time and without refrigeration. Food dehydration, by removing water, has the added benefit of reducing pack weight. Boxed Meals-Great starters to create amazing bc dishes! 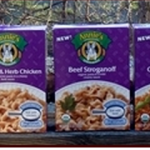 • Enhance store-bought boxed meals from Annies, Near East and Zatarains with dehydrated soups, vegetables, meat and beans then assemble into meals. • Create sauces blending a rich variety of dehydrated powders for flavor and calories (such as Powdered Peanut Butter, Butter Powder and Powdered Eggs. • Increase the ingredients proportionally by 1.5 or 2 times if you have a large appetite or you are cooking for two in the same pot. When shopping spend a little extra time scanning the sauce and ethnic food aisles where you can find great dehydrated veggie add-ons, or new sauces to try. Pre-cooked meats will last longer when packed in the middle of your pack to avoid direct sunlight and stored in shaded areas will help keep food cool. Below are suggestions on how to find food in different supermarkets in the Pacific Northwest. QFC/Fred Meyer: Great overall shopping with enough ethnic food and protein choices. Can find a variety of boil in a bag meals. Trader Joe’s: Good for grains, protein and flavor enhancers, lack good packed sauces. Safeway: You can find almost everything, but selection can be slim. Central Market/Uwajimaya: Nirvana of flavor! Both can show you flavors you may never have seen before, great place to go for longer trips. 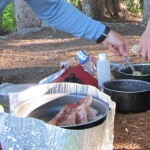 Baby steps into food planning and cooking mean trying the recipe at home or car camping then on 1-2 night trips. 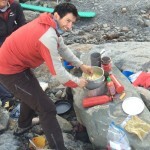 Be ready to have a crunchy or over spiced meal before you feel like the camp gourmand. 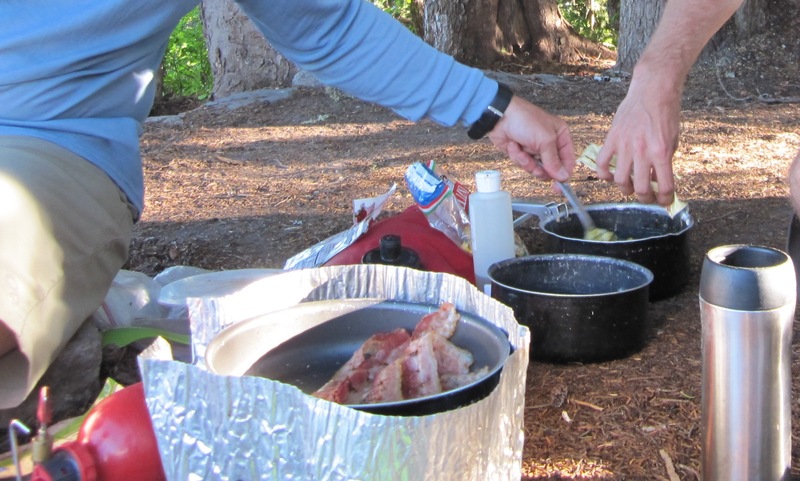 Once you gain confidence, you will rule the camp stove and people will thank you because everyone can smile at the end of a hard day in the back country with great food in their belly! Bon appetit!